The difference between marketing vs advertising has always been a topic of debate. Even seasoned marketers have failed to offer a clear conclusion about the understanding between marketing vs advertising. To put it simply, advertising is an important part of marketing. For the most part, advertising efforts are part of a company’s marketing campaign. However, all marketing efforts are not necessarily categorized as advertising, such as affiliate marketing for example. In some cases, businesses focus on advertising to capture markets, gain new customers and increase revenues. However, it is only marketing which can help in building customer relationships, enhancing brand image and establishing the identity of your business. In a competitive marketplace, business owners should utilize a strategic combination of marketing, including video marketing, and advertising to create a strong impact, driving sales growth. Ultimately, both marketing and advertising are geared towards attracting, converting and retaining customers. To help you understand the relationship between marketing and advertising, this post discusses marketing vs advertising in depth. In its broadest form, marketing is the sum of all the activities that a business undertakes to attract customers and sell products or services. According to this broad definition, marketing is a combination of sales, public relations, advertising, pricing, packaging and distribution. As you know, an important aspect of every business is attracting and convincing buyers to spend money on their products or services. Marketing assists businesses in finding the right customers to attract and convince. Moreover, marketing narrows down the audience, targeting only those who are likely to purchase your products or services. That is why their are so many internet marketing benefits, as well as benefits to traditional marketing practices. The marketing process can be summed up in three steps. As long as you understand the process involved in marketing procedures and practices, you can start your hands-on learning. Marketing is used to promote, distribute and price items or services, as mentioned above. As long as you plan, execute and control promotion, distribution and pricing, you are effectively marketing your business and it’s services or goods. Thoughtfully created marketing campaigns address particular buyer demands. They present your products as solutions to these buyers. However, the most important task of marketing is attracting customers, acquainting them with your brand and products. Since selling products is the ultimate objective of businesses, marketing strategies are implemented at every stage of product development, custom packaging and distributing. Well conceived marketing strategies enable businesses to succeed in attracting and converting prospective buyers. Finally, marketing is essential to add a competitive edge to your business, enabling you to stand apart from the competitors. Simply put, advertising is a method of communicating with your target customers. Businesses who aim to influence prospective customers to buy their products, spend money on different types of advertising campaigns. First off, advertising identifies current problems or challenges faced by prospective buyers. Next, it creates a story to address these problems, communicating solutions to the target audience. In order to be effective, advertising campaigns use various channels including television, print and digital media. Additionally, marketers use signage, mailings, radio and trade shows for advertising. What’s more, sponsorships and contests are often part of a business’s advertising campaign too. As mentioned earlier, paid advertising is a part of marketing. Advertising is a paid, non-personal message directed towards attracting the attention of potential buyers. Although advertising is defined as a way of conversing with prospective customers, there are several ways to communicate. Due to major changes in market environment, new models of communication have emerged such as persuasion, engagement, participation, facilitation and conversation. Depending on the target audience, advertisers will use various types of communications. On the other had, a marketing strategy determines how a business will introduce, promote, price and distribute its products. Furthermore, marketing dictates product development from the stage of conceptualization. In the first place, marketing enables businesses discover business opportunity by evaluating buyer demands. Additionally, marketing is an indispensable part of conducting a business while advertising is not. However, advertising does boost marketing efforts. If marketing is the umbrella term, branding is another subset that finds itself under that umbrella, just like advertising that uses business graphics. Branding is another crucial component of an effective marketing plan. Branding is the values your business holds itself to and what your business believes in. Additionally, it is also about the way consumers feel about your business and what they believe your business is all about. Obviously, that is a vital part of the purpose of marketing. That is why you should remember that it is not just about marketing vs advertising; it is also about marketing, advertising and branding. 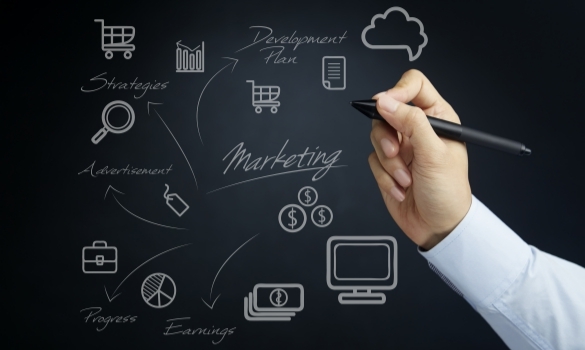 You should not forget this important component for a holistic marketing plan. Marketing vs advertising is a continuous debate among corporate marketers. Understanding the relationship between marketing and advertising assists business owners in attracting target audiences. Above all, marketing vs advertising clarifies the importance of each in business development and product promotions. As a result, business owners are capable of utilizing marketing and advertising appropriately.